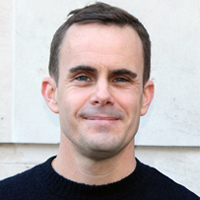 Regan Koch is a Lecturer in Human Geography at Queen Mary University of London. His interests are in matters of public space, urban sociality and collective culture, and the representation and imagination of urban life. Working between London and various cities across the US, Regan's research has focused on exploring novel food trends, social entrepreneurship, licensing laws and government regulations, and changing social norms related to how we live together in cities. His work has been published in Transactions of the Institute of British Geographers, Urban Studies, the International Journal of Urban and Regional Research, and in several edited collections.